Clients often have many questions about whether or not they are actually getting a “free consultation” and what they will have to pay throughout the case. Not all personal injury lawyers treat a “free consultation” the same, and you are entitled to know which contract you are making with your lawyer. What does it cost? 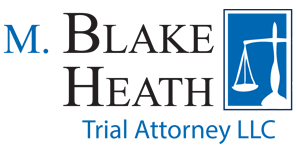 A free consultation with M. Blake Heath, Trial Attorney LLC is just that. You do not have to bring any money to pay for attorneys’ fees or for expenses. We will talk to you about your case for free and not force you to sign a contract. You are entitled to know your rights before being asked to sign a contract. How do I pay legal fees? Lawyers for the insurance company get a retainer up front for both attorneys’ fees and expenses. At M. Blake Heath, Trial Attorney LLC, our personal injury and wrongful death contracts provide that you will not have to pay any attorneys’ fees unless we successfully win your case. If there is no settlement or no jury verdict in your favor, you do not have to pay attorneys’ fees. How do I pay for expenses? The expenses on a personal injury case often include copy costs, experts, postage, collecting medical records and bills, medical doctors, and a host of other expenses. The insurance company has to write a check for those expenses as they are incurred by their defense counsel. At M. Blake Heath, Trial Attorney LLC, unless a judge specifically orders the plaintiff to pay the expenses (i.e., if a frivolous lawsuit is brought), the client does not have to pay any of the expenses or costs on a case unless there is a settlement or a verdict. Another important point to ask your lawyer is whether or not the expenses are taken out before or after the attorneys’ fees are calculated. If the attorneys’ fees are calculated first, then the lawyer may take home more money than the client. Make sure, as is done at M. Blake Heath, Trial Attorney LLC, that the expenses are taken out of any settlement and then the attorneys’ fees are calculated. That is the best thing for the client and encourages the lawyer to keep the expenses low. How do I know what is going on in my case? The number one complaint against personal injury lawyers is they do not return phone calls and they do not communicate well. At M. Blake Heath, Trial Attorney LLC, we have structured our firm so that you will always know what is going on with your case. While we always push for an early settlement of your case so that you can be immediately compensated, some cases can take up to two years to be resolved. During that time, you will get a copy of every letter that we receive and a copy of every letter that we send out. If a pleading is filed in your case, you will get a copy of it. It is your case, not ours. You are entitled to know exactly what is going on at every second of your case, and we are 100% committed to keeping you informed. Will my case go to trial or will it be settled? It is impossible to know which personal injury cases have to go all the way to trial and which cases will settle. Over 80% of our cases settle prior to trial. We do several things to encourage the settlement of cases. First and foremost, we zealously advocate for all of our clients so that insurance companies and defense lawyers know that we are not afraid to try a lawsuit. Clients do not want a quick and cheap settlement, they want a quick and fair settlement. We can help get a quick and fair settlement by having experienced staff at our firm work with us to get the case worked up and ready to be filed in Court. Lawyers who settle cheaply hurt not only their client, but all future clients. We are committed to getting fair and reasonable compensation for all of our clients. Who is working on my case? Clients should be entitled to know who is working on their case and that their case will not be referred out to some lawyer in some other state that the client does not know anything about. At M. Blake Heath, Trial Attorney LLC, we work on our own cases and have experienced staff to help. Your case will be assigned a paralegal, and you can call that paralegal at any time. Additionally, you will have personally met with one of the lawyers working on your case, and you can call that lawyer at any time. Our receptionist does not screen phone calls and you will be able to get through, if that person is in the office, every time you call. What if I want to fire my lawyer? At M. Blake Heath, Trial Attorney LLC, we are one of the few firms that will take cases where the plaintiff has fired their previous lawyer. Lawyers should be fired if they do not work up a case and respond to questions by the client. In Missouri, a lawyer who has been fired has the right to be paid quantum merit for the value they have added to your case. If your lawyer is not communicating with you and not working on your case and moving it along, please do not hesitate to contact us to discuss whether or not you should fire your existing lawyer.